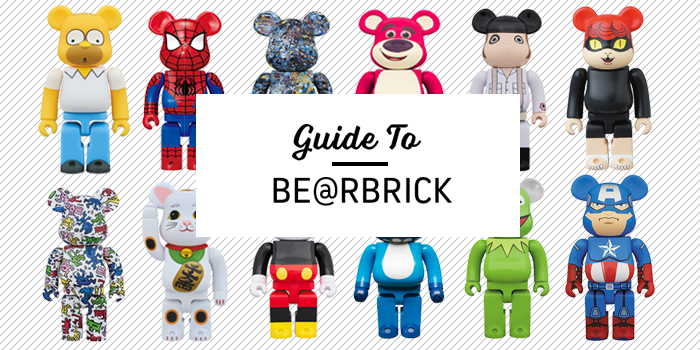 You are here:Home Recommended Guide to Bearbrick: The origins, how to buy, where to buy and much more! Guide to Bearbrick: The origins, how to buy, where to buy and much more! Bearbrick (stylized as BE@RBRICK) is a series of bear-shaped designer toys by Medicom Toy Inc and are most often sold in “blind box” assortments. The design is a variant of another popular line by Medicom, the Kubrick. Each figure appears as an anthropomorphized bear with a pot belly. Bearbricks are articulated, with the head, waist, arms, wrists, and legs all able to swivel. The first ever Bearbrick was released in 2001, as a gift to visitors of the World Character Convention 12 in Tokyo. 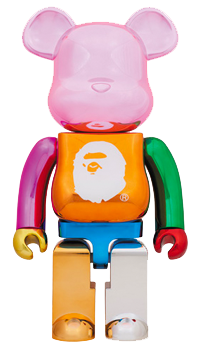 Not long after their initial debut, Bearbricks became a must-have collectible not just in design toy circles, but also in the world of hip-hop. 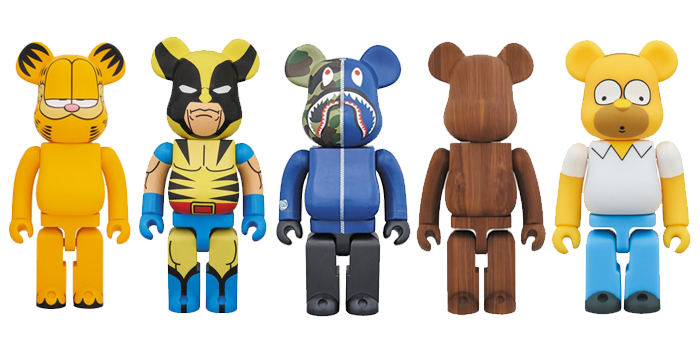 Celebrity collectors of Bearbrick include the likes of Pharrell Williams, DJ Khaled, and BAPE founder Nigo. Due to the sheer amount of variety when it comes to these designer toys, the world of Bearbrick can seem quite daunting to the would-be collector. But fear not, as this blog post has you covered – read on to get the lowdown on the world’s favorite designer toy! Standard The most common of all Bearbrick formats. All Bearbricks in this series are released under several different recurring “themes”. Basic: Solid-color Bearbricks with a letter in a contrasting color on its chest. There are nine varieties of this Basic Bearbricks in this set, which spelling out the word Bearbrick when lined up. Their rarity is categorized as 14.58% by MediCom. Artist: Bearbricks made in collaborations with visual artists. Usually, two artist figures are released per Bearbrick series. MediCom rates Artist Bearbrick rarity as 4.26% or 1.04%. Secret: Unannounced designs that usually of higher value and rarer than the above Bearbrick types. As such, MediCom ranks them as 0.52% in terms of their rarity, the highest of all the Bearbrick types. While there are some outliers from this model, most Bearbricks fall under the following themes, with the blind box stating the rarity of each theme. Jellybean: Solid-color clear Bearbricks molded from translucent plastic. Their rarity is 11.44%. Flag: Bearbricks painted with a nation’s flag, with a 9.37% chance of occurring. Animal: Bearbricks based on animals which have a rarity of 8.33%. Cute: Adorable Bearbricks that encapsulate the Japanese concept of “kawaii”. These Bearbricks have a rarity of 13.54%. Horror: These Bearbrick designs are based on well-loved horror film franchises or other sources from the horror genre. They occur at a rate of 9.37%. SF (Science Fiction): Bearbricks based on characters and themes from popular Sci-Fi franchises. Their rarity is 9.37%. Hero: The newest addition of the Bearbrick family, Hero Theme Bearbricks depict superheroes from DC Comics, with their chance of occurring being 7.29%. 100% Bearbricks are considered the standard size of the figures, standing at 7 centimeters tall. 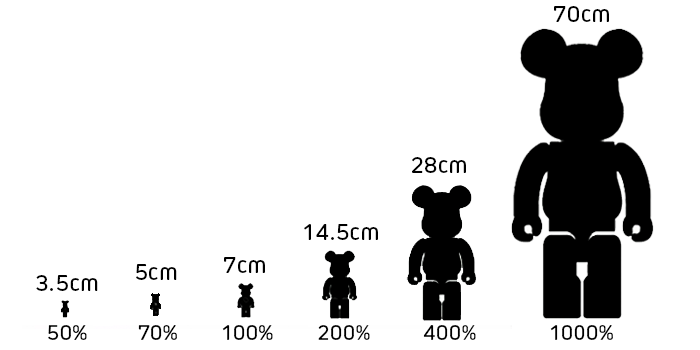 The other Bearbrick sizes are named relative to this size: 1000% being 70 centimeters, the 400% at 28 centimeters, 200% at 14.5 centimeters, 70% at 5 centimeters and the 50% coming in at a tiny 3.5 centimeters! The bigger sizes of Bearbricks tend to be sold as-is and not in the blind box format. There are some Bearbricks that fall outside of the typical shapes and sizes of the toy, falling under the “other” size category. While each size of Bearbrick has its own unique charm, the 400% and 1000% sizes are the favorites amongst serious collectors. MediCom created this Bearbrick with long-time collaborater BAPE to celebrate the legendary streetwear brand’s 25th birthday. Luxury fashion brand Chanel teamed up with Medicom to create this suitably chic version of Chanel founder, Coco Chanel. Sold at a charity auction for $28,000, making her one of the most expensive Bearbricks ever. This Bearbrick named “Chompers” was designed by one of America’s most well-known graphic artists Brian Donnely, also known as KAWS. The Bearbrick was made in conjunction with the Japanese musical festival “a-nation”, selling at auction for $2,800. 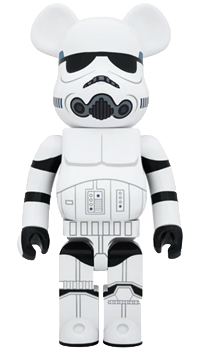 This rendition of Star Wars’ iconic Stormtrooper was released at the 2015 Medicom Toy Exhibition alongside other Bearbrick versions of Star Wars heavyweights including Darth Vader and Boba Fett. Unfortunately, Medicom’s online store does not take orders from outside Japan or ship overseas, making these already exclusive figures even more difficult to get your paws on. But that’s where FROM JAPAN comes in! FROM JAPAN’s proxy buying service allows you to buy directly from Bearbrick’s official Rakuten Store and have your Bearbrick shipped directly to your door. 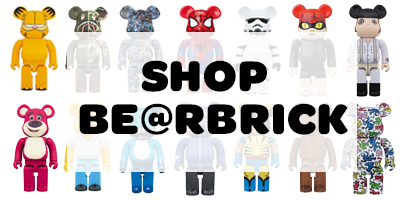 Start your Bearbrick collection now with FROM JAPAN! FROM JAPAN is a proxy bidding and ordering service for Japanese auction and shopping sites. Easily order from Yahoo! Auctions Japan, Rakuten, Amazon, and more. To get started, try searching for an item you want to buy!